» Homer Like It’s 2009: What’s Fueling Mark Teixeira’s Resurgence? Albert Pujols’s power resurgence, capped off by a three-homer Monday, has been one of this season’s best offensive stories. But Pujols has only barely been the best-hitting 35-year-old first baseman in the American League, and he’s not the one who’s improved the most relative to his recent-past performance. On that count, he’s beaten by Yankees switch-hitting first baseman and — yes, it’s safe to say it — slugger Mark Teixeira. Like his teammate Alex Rodriguez, Teixeira has approximated his peak offensive production this season after two years of contributing next to nothing. In 2009, his first year with the Yankees — and, prior to 2015, his last All-Star season — Teixeira was 42 percent better than the average major league hitter,1 after accounting for the fact he played in a park where one could hit homers like this. Thus far in 2015, Teixeira’s bat has been 43 percent better than league average — three points behind Pujols, whom he now trails by six homers. Teixeira has the same explanation as Pujols for his ability to turn back the clock: He’s no longer seriously injured. Teixeira’s past three summers produced a lengthy list of physical problems: in 2012, a calf strain that cost him all of September; in 2013, a tendon sheath tear (and re-tear) in his wrist that required surgery and robbed him of all but 15 games; in 2014, ongoing issues with the wrist, which was slow to recover, and a hamstring strain that sent him to the disabled list. Although the evidence for a link between wrist problems and power outages is inconclusive across all cases, pain or weakness in that part of the body can be debilitating, and Teixeira credits his bounce back to his wrist’s return to health. This year, he’s suffered a succession of minor, middle-aged maladies — a stiff neck, a bruised toe, a sore lat — but none of those issues has sidelined him for long or significantly hampered him at the plate. 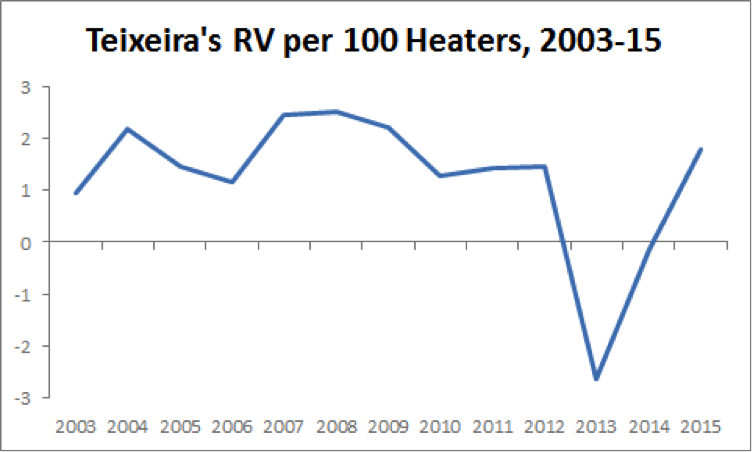 On the most fundamental level, Teixeira is hitting more like he did in 2009 because he feels more like he did in 2009. 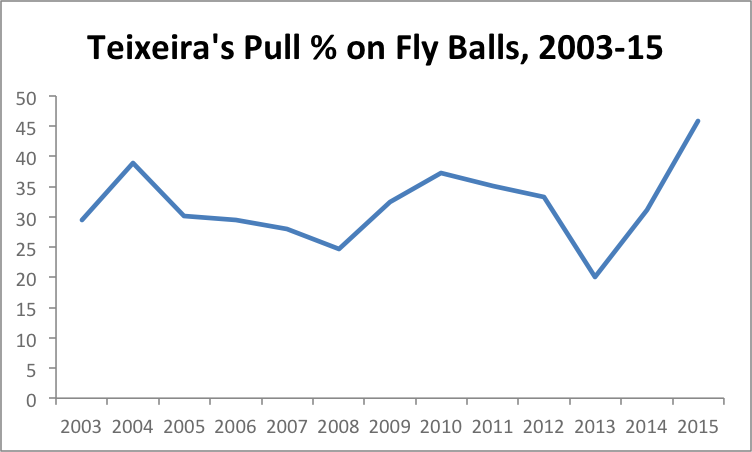 From 2003–09, Teixeira was a .290 hitter who finished over .300 in three full seasons. Since then, he’s batted .243. That’s partly a product of age, injury, and the offensive environment, but it’s not as if Teixeira has had trouble putting balls in play: His problems largely arise after balls leave his bat. In 2009, Teixeira faced infield shifts in only 40 of 499 (8.6 percent) plate appearances from the left side that were tracked by Baseball Info Solutions, and none of his PA from the right side.2 This year, he’s been shifted (and shafted) in 189 of 201 (94.0 percent) tracked PA from the left side, and 39 of 84 (46.4 percent) from the right side. He’s one of the most obvious victims of a strategy that’s designed to steal singles from players who fit his pull-heavy profile. Among qualified hitters from 2015, only Giancarlo Stanton — who, like Teixeira, has 34 singles and 74 hits — has seen singles account for as low a percentage of his hits. In past seasons, it seemed as if bunting would be Teixeira’s best chance to defeat the defensive shift. Teixeira toyed with the idea of dropping one down in 2012, but he never followed through: Almost 7,500 PA into his big league career, he’s yet to get on the board, bunt-wise. While bunting to beat the shift would be wise for many shift-plagued pull hitters, Teixeira had no track record with the technique, and he also had misgivings about abandoning his signature power stroke, even as a temporary deterrent. So instead of trying to reinvent himself as a “pretty ugly slap hitter,” he joined the annual legion of players in the best shape of their lives and entered this season with a mantra more befitting of a former league leader in the long ball: “Hit more home runs, hit more doubles, and walk more.” Unlike the Royals’ Mike Moustakas, who resolved to conquer the perils of pull hitting by aiming more often (and more effectively) for the opposite field, Teixeira intended to do what he’d done before, but better. Teixeira has become his best self while steering into the skid and evolving into an even more pronounced pull hitter. Not only has he continued to pull nearly 70 percent of his grounders (and watch some of them get swallowed by repositioned opponents), he’s also pulling almost half of his fly balls, by far his highest career percentage. If Teixeira is cheating on fastballs or selling out for power, it hasn’t hurt him so far. Nor has his low BABIP been a deathblow. Teixeira has posted the fifth-best production per plate appearance, relative to the league, of any qualified hitter since 1900 with a BABIP of .235 or below. BABIP excludes home runs, which technically aren’t “in play,”4 but even by Batting Average on Contact (often amusingly abbreviated as BACON) Teixeira’s season would rank 10th since 19545 among qualified hitters who’ve come up empty as often when they’ve put the ball in play. It was apparent this spring that an inordinate number of the Steinbrenners’ prop bets would have to pay out in order for the Yankees to finish first in an up-for-grabs AL East. Michael Pineda, Masahiro Tanaka, and Ivan Nova would have to be healthy-ish, and last year’s brigade of broken-down, over-the-hill hitters (Carlos Beltran, Brian McCann, Rodriguez, and Teixeira) would have to hit a lot like they did when the team last won a title. Improbably, those unlikely outcomes have occurred, to varying degrees. Coupled with regular heroics by Brett Gardner and an airtight, recently rebuilt bullpen, the Yankees’ unexpected contributions from the elderly and formerly infirm have helped them survive CC Sabathia’s latter-day Tim Lincecum impression, Chase Headley’s Safeco-esque slash line, and a months-long meeting of Middle Infielders Anonymous. Their four-game lead in the AL East would be even slimmer if Teixeira hadn’t discovered how to hit like Harmon Killebrew, but both his repaired wrist and the shift have in some respects made him stronger. No, it wasn’t quite into the second deck. But it wasn’t 95, either — it was 98. All right, he’s back. BIS notes that its shift data for 2009 isn’t as comprehensive as it is for subsequent seasons, but use of the shift is about eight times as common today as it was even in 2010, the first fully reliable year. Historically, Teixeira has been a better hitter from the left side, although he’s always had more power as a right-handed hitter. This year, he’s been better overall from the left side, where he’s hit 17 of his 23 homers. Which no one told Mike Trout. The first season in which sacrifice flies were official.